A perennial favorite mix that's durable & tough with the perfect old-fashioned appearance. Planted extensively in parks & communities throughout Europe for centuries. Burpee Perennial tulip mix is a customer favorite that's durable and tough with the perfect old-fashioned appearance. 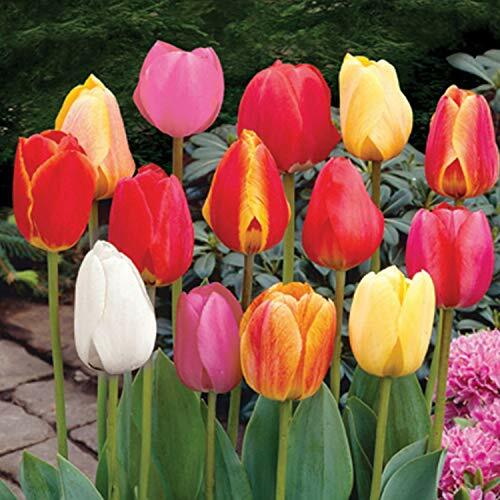 A very tough tulip assortment that withstands locations that are not ideal. Blooms late. Tulips grow Best in full sun to light shade in a light, well-drained soil enriched with organic matter. Plant tulips in the early Autumn; 4-5 inches deep, 3-6 inches apart. When preparing soil, add fertilizer, such as Burpee natural and organic bone meal, when you prepare the soil. Be sure to mix the fertilizer into the soil so it does not come into direct contact with the bulbs. If you have any questions about this product by Burpee, contact us by completing and submitting the form below. If you are looking for a specif part number, please include it with your message. Botanical Interests"Butterfly Garden and Monarch Way Station" Flower Seed Collection - 15 Packets with Gift Box. $1 Goes to Save Our Monarchs Foundation!